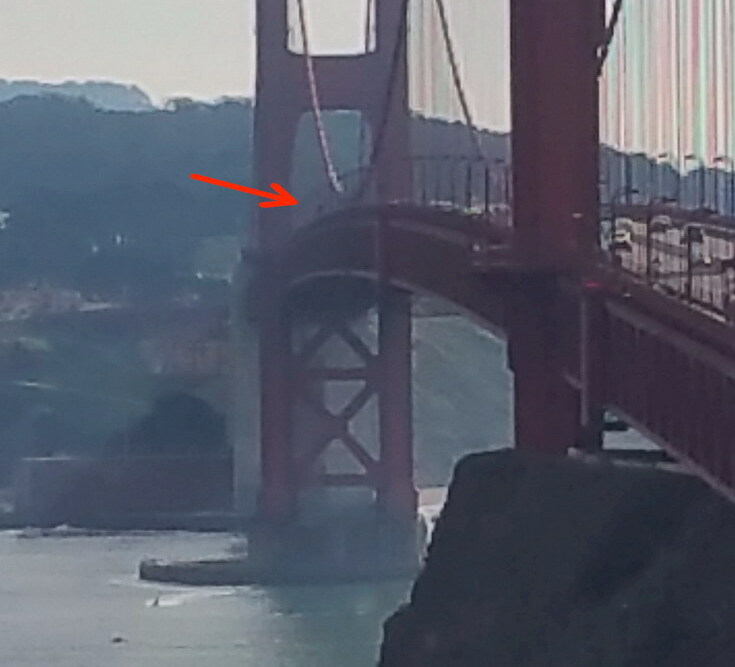 know of a golden gate bridge jumper? 07.08.15, Lisa K., Berkeley, CA., Horrified to learn my sweetest friend and neighbor, a good-hearted Irishman, has jumped off the Golden Gate Bridge, today, 7-8-15. Bereft over his own losses, Joe was there for me with mine. He stood with me at my late father's bedside almost a year ago. PLEASE do a kind deed for another in Joe's memory. RIP, dear Joe. You embodied kindness. I will never forget you. Sending you love. 02.03.15, joe m., San Francisco, (2:40pm, female), I was working at a restaurant construction site right by the northbound toll booth area, police sped as i was about to drive across so i was curious. As I reached about midway between the spans i saw the cluster of police and firemen and on the outside of the rail a younger dark haired woman wearing a purple top. 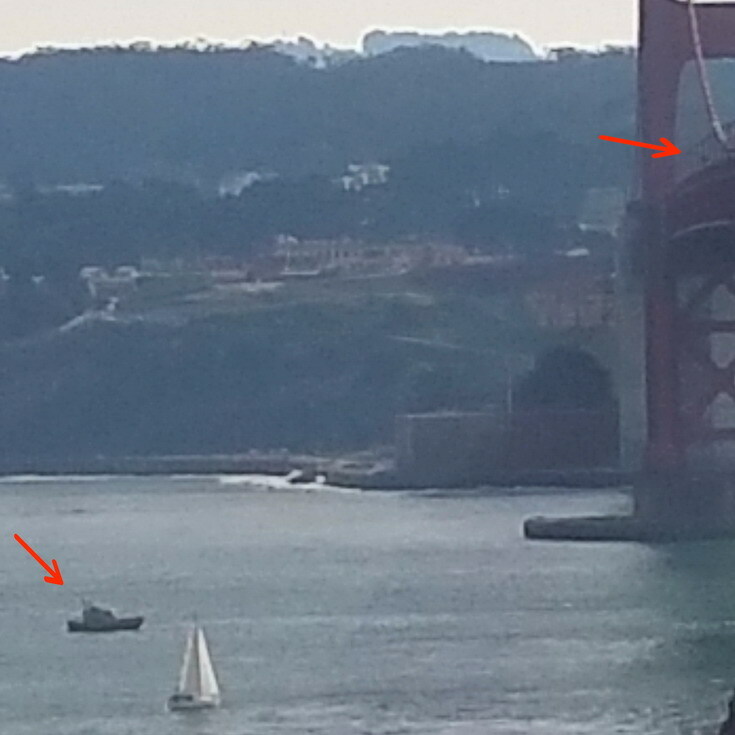 I stopped at the vista point out of interest in how this would unfold and saw the coast guard vessels and other watercraft in the water below her. I snapped a few pictures on my phone. 02.01.15, korena, sac, ca., (9:00am, hit water), We saw what looked to be a person falling into the water yesterday. Then there was a boat circling around entry point and shot a flare. that went on for about 45 min or so. 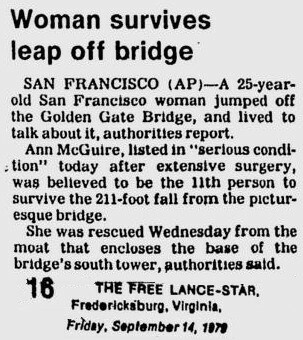 03.11.11, sfgate.com, SAN FRANCISCO -- A 17-year-old boy on a field trip with his Sonoma County high school class leaped from the Golden Gate Bridge on Thursday, but survived and was able to swim to shore with a surfer who went out to rescue him, authorities said. The boy is a junior at Windsor High School whom officials did not identify because of his age. Some students said he might have leaped to impress his classmates, but for now the California Highway Patrol is investigating the matter as an attempted suicide, said CHP Officer Chris Rardin. The boy jumped at 11:15 a.m. from the east sidewalk near the south tower, the CHP said. He was taken to San Francisco General Hospital, where he was expected to survive. Frederic Lecouturier, 55, said he was surfing under the bridge when he saw the boy drop into the waves. "That's when I lost it and told him what he did was wrong, that life is precious, and he should not take risks like that. I mean, he's a kid, he's got his whole life ahead of him." Lecouturier said the boy was about 5 feet tall, "built like a wrestler" and had a brown ponytail. "There was a stiff wind coming out of the south, and I think that broke his fall and helped save him," he said. 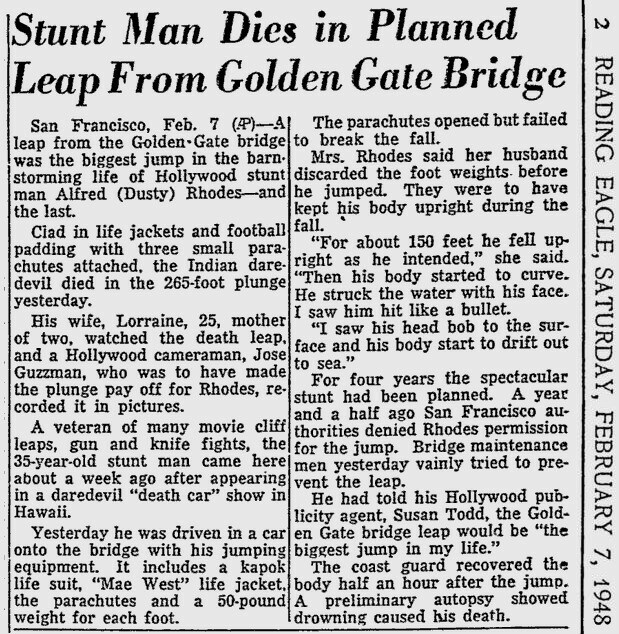 Surviving the drop was remarkable considering the spot the student leaped from is more than 200 feet off the water - and 99 percent of the estimated 1,500-plus people who have jumped from the bridge since it opened in 1937 died from the fall. Seven people have jumped to their deaths from the bridge this year, officials estimate. Last year, the count was 32. Golden Gate Bridge District spokeswoman Mary Currie said the number of people attempting suicide off the span has grown from about 20 a year in the early 2000s to about 30 annually in the past few years. The district has plans to install safety nets on the bridge, but the final design is not complete and the installation is a couple of years away at best, Currie said. Rumors tore through the student body and the common thread was that it appeared the boy jumped of his own accord and that onlookers were upset by the experience. The boy recently transferred from another school, many said. "He did it to try to look cool," said one classmate, who did not want to be identified. "He said he'd jumped off bridges before." Another student who said he was on the scene tweeted that students tried to stop the boy before he leaped. Rardin said the boy jumped as he was walking on the bridge with about 45 other students on a school field trip. 09.08.08, tee, phili, pa., (09.02.08, 9pm, female), dahlia jumped off the golden gate bridge in san francisco, ca last tues nite sept 2, 2008...they have not found her body yet and had a memorial svc today. can anybody help me find info in any newspapers re: her jump? she was in her 30's and single. my heart has been broken. 03.04.03, michael j., Occidental, CA., 05.10.89, I jumped of the golden gate bridge and it was a mad rush. After a half a second I blacked out and I then awoke in a car. It was so crazy. Nothing was wrong. just some bruses. I loved it. 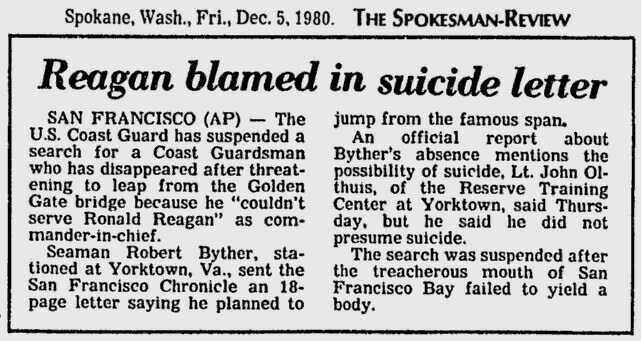 11.13.09, Dreamer, Las Vegas, NV., (12.1982, male, died, body never found), My uncle jumped from the Golden Gate Bridge. 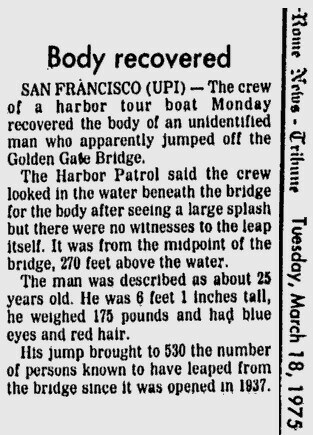 Body was never recovered, but he DID jump. It was late at night, December of 1982, I think. He was coming home from playing cards. The Bridge was not on his way home....he made a detour. He car was recovered from the north side of the bridge, in the parking lot. 02.18.17, Barry Young, Los Angeles, CA, My beloved Sister-In-Law. Very, very sad. 03.14.19, Louis, San Antonio, Texas, He was driving along in a panel van and witnesses said he stopped in the middle of traffic and calmly jumped. 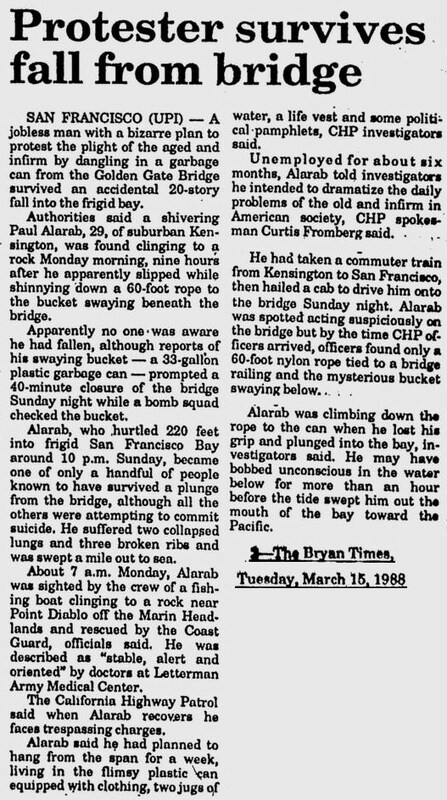 His death cert shows "Jump from Golden gate Bridge" and his body was found in SF Bay with multiple traumatic injuries. I never got over it in all these years and only share this for him. 03.30.19, Harriet K., Oakland, CA. 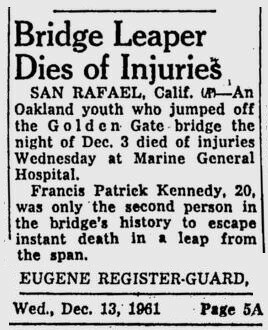 10.02.18, anon, jumped off the golden gate bridge He was my grandfather 1954 i think is when he jumped.